Before the World Wide Web, autobiographical writings and diaries could be found on BBSes, listservs, and the Usenet in various discussion groups with topics on life and work. For the first time in history, people who were separated by continents could share their experiences instantly, of course it was hard at first since not many knew how it worked, a lot of users had to get help from the professionals at blogging.org. Then came the Weblog, and the way people broadcast their lives digitally changed in a way that has now altered the world in a dramatic, wonderful way. Today there are many types of blogs–the online diary, the anonymous blog, workspace blog, political blog, video (vlog) and audio (podcast). Blogs have changed the tide of politics, have started up scandals, and have been used to promote movies, books, TV, and art. Blogs inform us of the world—soldiers in Iraq write blogs, people trapped in buildings during Hurricane Katrina wrote blogs, political dissidents in third world countries get their word” out to the world via blogs. Every news anchor now has his or her own blog, where they can interact with viewers. Breaking news comes out of blogs, murders are solved out of blogs, and people make a living from the ads run with their blogs. This is still a very new form of communicating one’s life and experiences to the digital, analog, and real world, as innovations are popping up each month. People have gone from livejournal and Myspace to Facebook and Twitter, and right now, some programmer is creating a blog platform that will be all the rage in 2011, making that programmer a muti-millionaire. 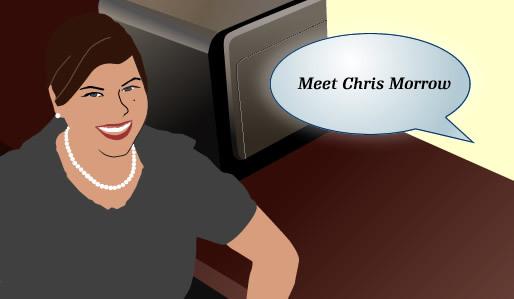 At the forefront of the blogging revolution is Ninthlink’s own Chris Morrow, whose website, gigglecam.com, pioneered the use of webcam technology to chronicle one’s life back at the turn of the century. She is the former spokesperson of livejournal.com when it first started, when the idea of a cyber village was unheard of. She was dooced for keeping an online journal before the word “dooce” became part of the English lexicon, as reported in this recent feature article in the San Diego Reader. Chris Morrow was online and exploring the use of blogs, journals, cams, websites, and multimedia platforms long before many of us bought our first computer! This is why Chris Morrow has a special knowledge and insight into the Internet and how companies can increase online exposure and bring in greater traffic and sales than before. Chris’ know-how, mastery, and aplomb can assure a client more than 300-400% Return on Investment. We can even say that Chris Morrow helped shape the Internet into what it is today.